This is the second story in a five-part series. 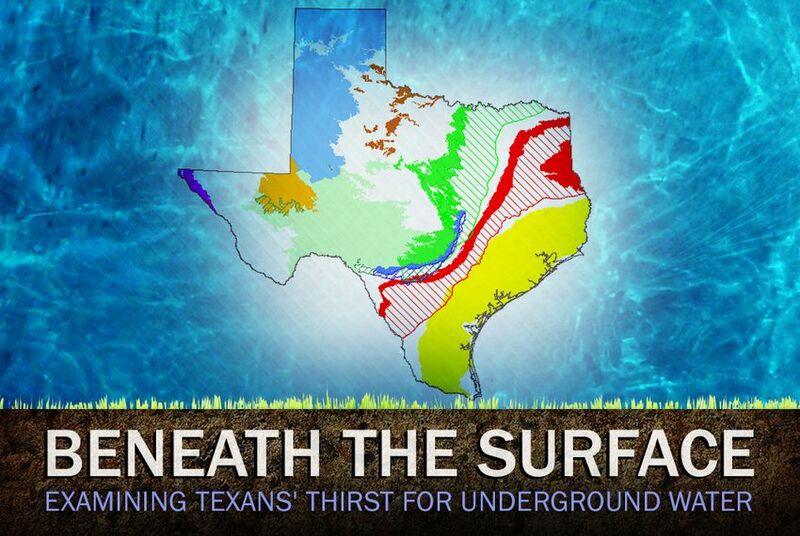 Like any natural resource, the precious groundwater that flows under Texas’ land does not follow political boundaries. The state is home to nine major and 21 minor aquifers, some of which stretch across the entire state and have segments with wildly different hydrologic properties. Yet at a time when thirsty cities and industries are clamoring for groundwater more than ever, the resource is regulated by nearly 100 entities drawn along political boundaries such as county lines, in part because groundwater is considered a private property right in Texas. By contrast, Texas’ rivers and lakes — anything that flows above ground — are owned by the state and therefore regulated centrally. Such a system has been in place since 1949, when state legislators allowed for groundwater conservation districts, or GCDs, to control local groundwater. And although the system has undergone significant changes, it hasn’t solved the conundrum it faces when several GCDs are charged with managing the same aquifer but have vastly different ideas of how to do so. While some say a more universal set of rules for GCDs is needed to preserve groundwater resources, supporters say groundwater must remain locally controlled by communities to protect individuals' private property rights. One of the most vocal opponents of the status quo has been the city of San Antonio, which is eyeing groundwater troves far away from its own depleted Edwards Aquifer. The San Antonio Water System has found itself on the defensive with a number of GCDs over attempts to shore up its water supplies, often facing a different set of rules each time. One reason that a controversial proposal to pump water from the Edwards-Trinity Aquifer in Val Verde County is so attractive to the city is that there is no groundwater regulation district there, officials say. “The notion that this can be done by 100 different, locally elected, county-based groundwater districts simply no longer makes sense,” said Steve Kosub, a lawyer for the San Antonio Water System. He said the state must play a greater role in groundwater planning and regulation so cities like San Antonio have a chance at finding new water resources. But proponents say the system of local control is integral to Texas’ economy. In South Texas’ vast Carrizo-Wilcox Aquifer, which is managed by 21 different GCDs, for instance, “part of that aquifer has very urbanized areas over it; part of it is mostly wildlife and hill country,” said Greg Ellis, a lawyer who represents GCDs across the state. A rural county would rightly regulate an aquifer differently than an urban county, because the pumping needs are different, he said. “We’ve got to consider the community that survives off of that aquifer, not just the science of the aquifer,” Ellis added. Forcing a rural district to adopt the same rules as an urban one, or vice versa, could significantly change the area's economics. At the same time, the Carrizo-Wilcox also demonstrates the challenges created by patchwork regulation of groundwater. Some portions of the aquifer aren’t regulated at all, because no groundwater conservation district has been created in a few counties that lie atop the resource. The Legislature requires all districts to decide on desired future conditions, or DFCs, which envision how much groundwater should be preserved for future use. But within the Carrizo-Wilcox and other aquifers, the various districts have adopted different DFCs. And some enforce rules far more strictly than others. A recent state audit of 23 GCDs, some of which are in the Carrizo-Wilcox, found that only 8 percent of them fully achieved their goals for groundwater management. State law says that districts within the same aquifer must coordinate with one another, and lawmakers beefed up those requirements in 2011. But that hasn't resolved the issues. In 2004, a water policy committee recommended a number of changes to groundwater districts, including creating a statewide GCD for areas that don't have districts and changing their boundaries to "better reflect hydrogeologic boundaries." None of those recommendations have been implemented. “You’ve got to have uniform rules that we’re all going to operate under," said state Sen. Troy Fraser, R-Horseshoe Bay, who is chairman of the Senate Natural Resources Committee. But he did not provide specifics on how to establish those, quickly adding, "I don't want to set up a system of state control." The bigger issue for many GCD representatives is funding. Some GCDs run multimillion-dollar operations: Financed by well permitting fees and in some cases local taxes, they have a number of scientists on their staff and a substantial legal budget. In other cases, districts run on shoestring budgets. The Texas Water Development Board, the state agency that is supposed to help districts collect data and model aquifer drawdowns, has experienced significant cutbacks in legislative funding. Some GCD managers have suggested that the state provide a pool of money they could use to compensate landowners if the district is accused of taking their private property by limiting the amount of groundwater they can pump, and the court rules in the landowners’ favor. That idea isn't likely to gain any traction, however, now that the state has committed $2 billion in funding water infrastructure projects. “We would not be going back to the Legislature to ask for more money," Fraser said. But groundwater districts don’t deserve all the sympathy, said Billy Howe, legislative director for the Texas Farm Bureau, an agricultural lobbying organization. When most GCDs were created, they focused on making sure current and historic water pumpers wouldn’t need to change their habits, he said. Instead, they should have encouraged them to limit their pumping as much as they could, knowing that new users would be entering the picture and competing for dwindling resources. Like many water debates in Texas, the issue may be left up to the courts. In the Texas Panhandle, oilman T. Boone Pickens, who several years ago bought up significant underground water resources, found that his property straddled several different groundwater districts, with varying DFCs, that lay in the fast-depleting Ogallala Aquifer. Pickens sued the state, arguing it should have put an end to what he says are conflicting rules that could devalue his water. But that suit was dropped after Pickens sold his water interests.